Glow-On Original on the front and Glow-On Pink on the rear. Please notice, the glow on the pink is a soft glow compared to the Original "green" glow. We give free products away from time to time to our friends on Facebook and Youtube. 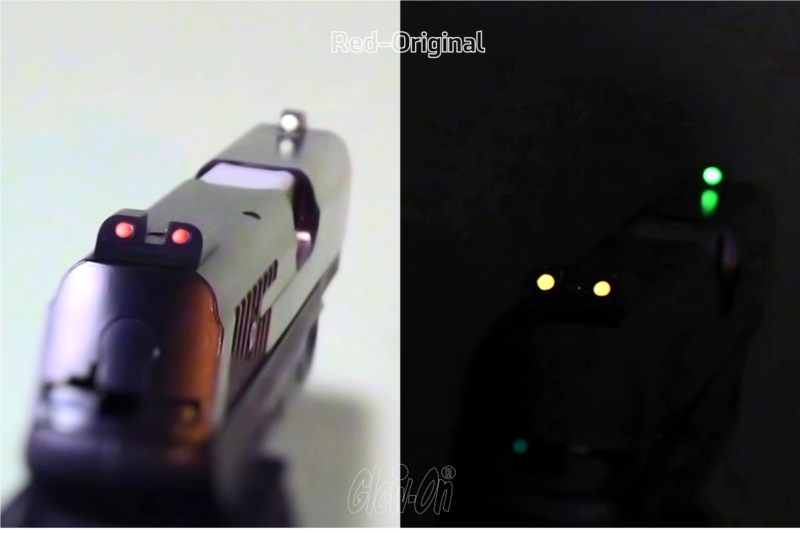 A nice option for gun sights for which otherwise there is nothing else. Or if your budget has a different focus for the time being. Or if upgrades are difficult or impossible to get by. Our website, secure payment provided by PayPal. You don't need a PayPal account, you can pay directly with your credit card. 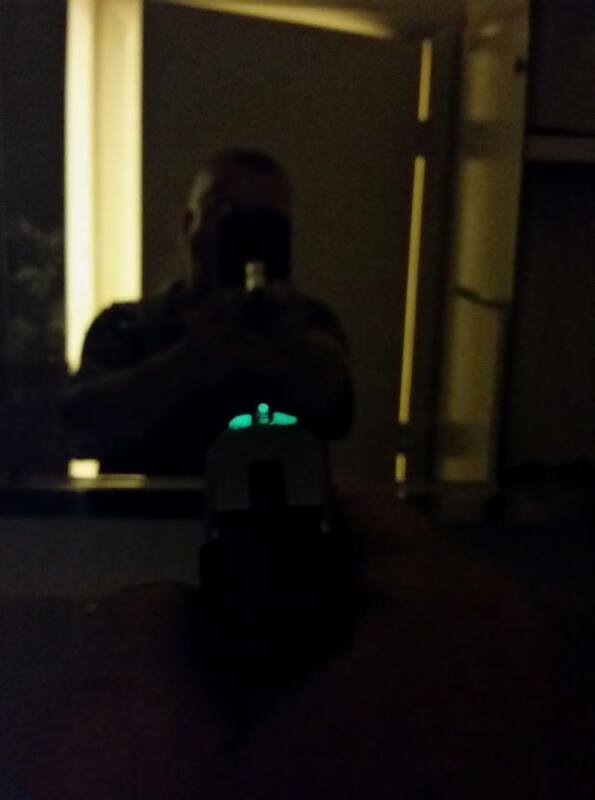 Glow-On Super Phosphorescent is for small projects: Gunsights, fishing lures, electronics, small-scale models, etc. 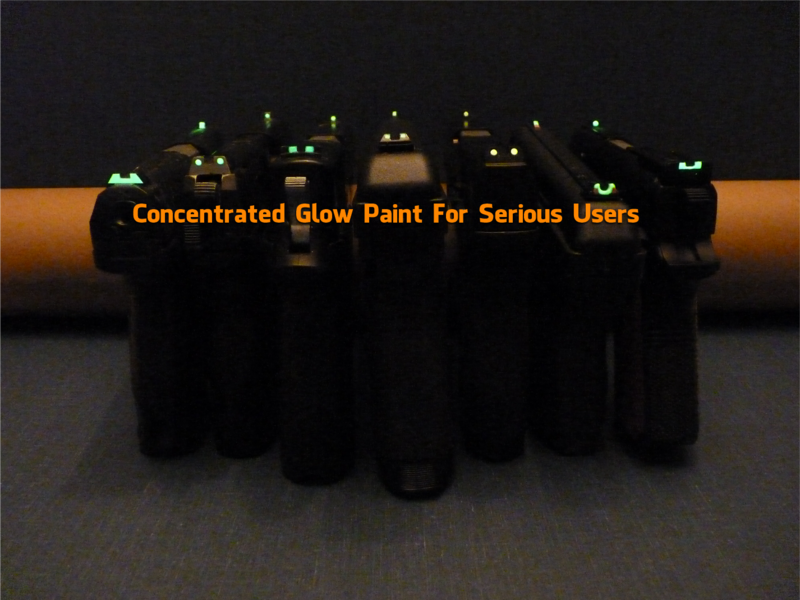 The Extreme Glow Paint for Professionals! 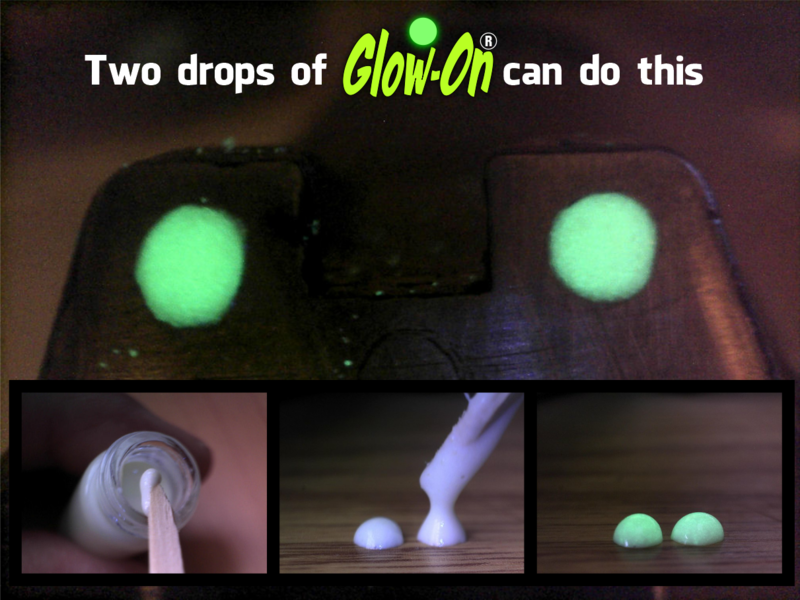 Glow-On is a super bright, concentrated, glow in the dark paint, with a nice and silky texture. With twice the amount of glow particles and half the binder than other competitive products. Glow-On is opaque, it contains its own primer, it covers dark surfaces efficiently. Available in paint and film forms. Gun sights, Fishing lures, Small Electronics, Arts & Crafts, Scale Modeling, Photography, Camping Equipment, etc. Original, Yellow, Green, Aqua, Blue, Bubble Gum Red, Hot Pink, and Orange. 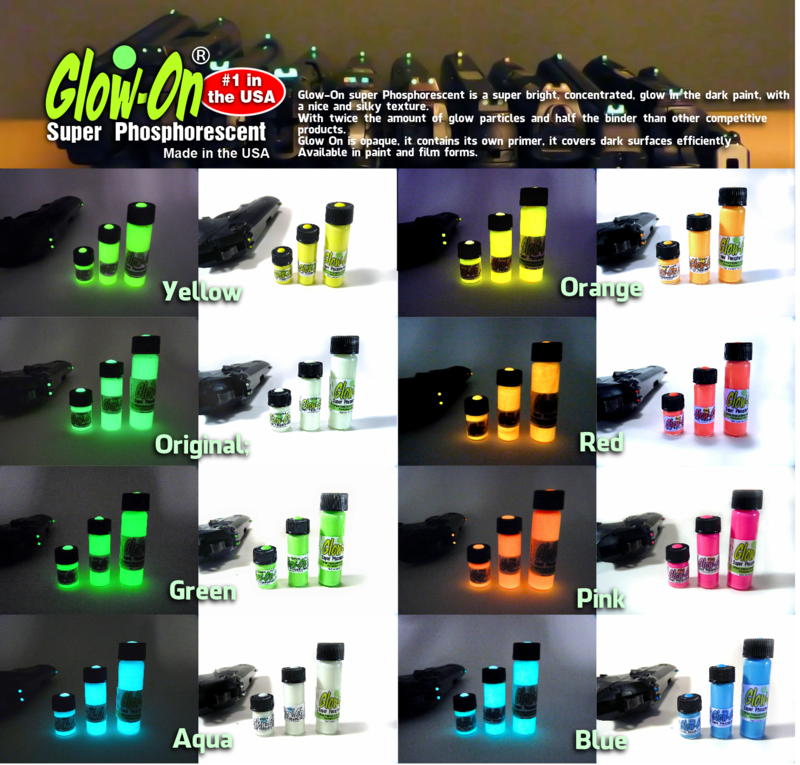 For the brightest glow, please choose Glow-on Original. This is what you'd expect to find at our website storefront as well as Amazon and eBay. 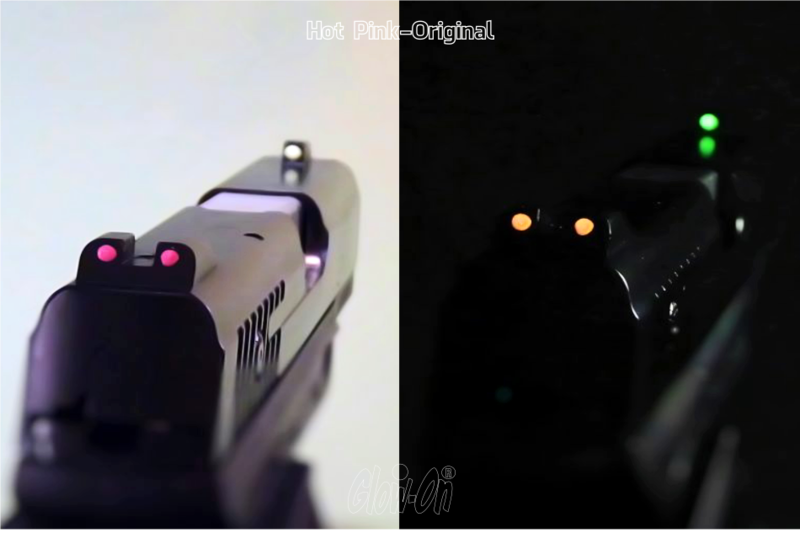 We've received a number of emails and messages inquiring about how to improve jus the front sights with Glow-On. Here is a quick how-to-do-it slideshow, barely 30 seconds. For the price of a fast food meal, you can do several firearms in one go. a great weekend project really. 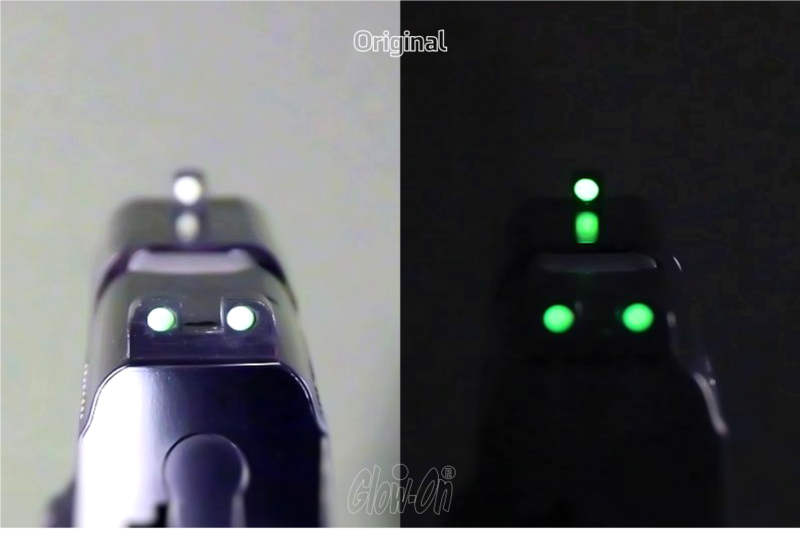 Glow-On will make you and your gun sights more efficient. Glow-On is also the easiest upgrade, the application is very simple. We don't use nozzles or syringes or anything complicated. Just a stick, in fact, a toothpick will work great! On this tutorial three guns in three minutes. Granted I have a lot of experience, it's easy for me. But it's easy because we designed it to be that way. One flat plain set, a set of white dots and another set where we stripped the white painted dots and left clean dark wells. You can do whatever you can think with it, there are no limits really. No syringes or nozzles that clog or brushes to clean are needed. Heck, you can use a toothpick! in your own opinion, which three products have the best glow? 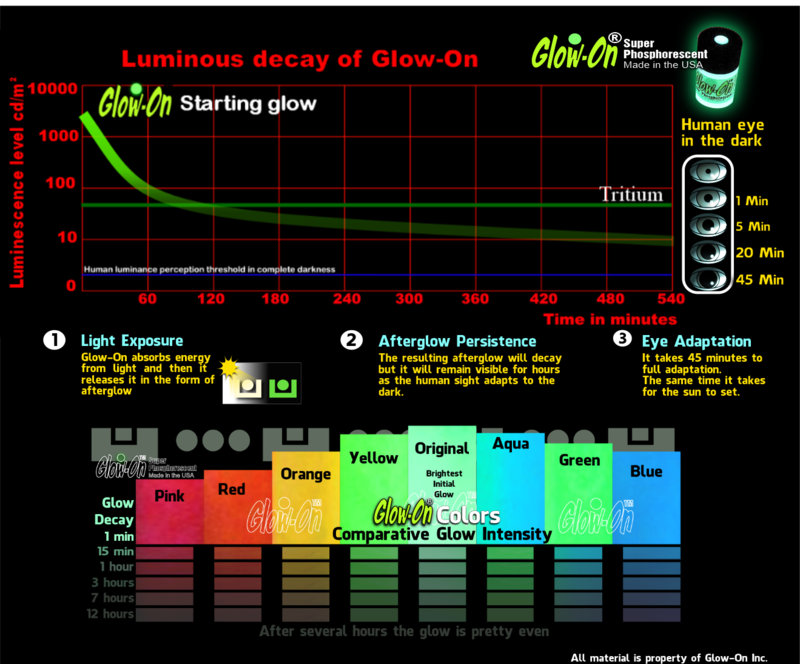 In order of glow Intensity.